This versatile box is useful in many different applications. 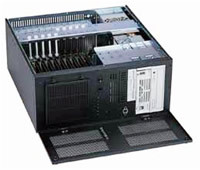 It has 2 x 5.25" open bay, 2 x 3.5" open bay, 1 x 3.5" HDD bay (hidden), which makes it perfect as workstation. It can be stood upright or wallmounted.